Every summer, Grantchester Meadows play host to sunset screenings of popular films, both new and old. This weekend’s programme includes Oscar winning ‘La La Land,’ the classic ‘Sound of Music,’ and family favourites ‘Lego Batman’ and ‘Moana,’ amongst many others. Films are shown on Friday, Saturday, Sunday and Monday, and you can either take a picnic or choose from local street-food vendors. Don’t forget to take a blanket as it may get a little chilly after sundown! Cambridge boasts a great range of independent cocktail bars, and this weekend they all come together in the Cambridge Corn Exchange for a festival of drinks, live music, DJs and street food. 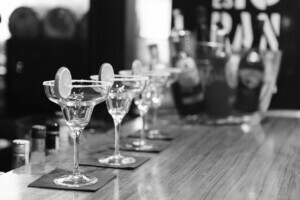 You can even try your hand at cocktail making, with free masterclasses and workshops throughout the day. What better way to celebrate the bank holiday than with a daytime party on a roof terrace? Lola Lo nightclub hosts the Wonky Disco Alfresco on 27th August, where you can expect house music, colourful decorations, cocktails and a fun, laid-back vibe. The event is free, but you must be on the guestlist, so you’ll need to contact the event organisers here. If art & culture is more your thing, the Fitzwilliam Museum (part of Cambridge University), has a number of special exhibitions and displays showing this weekend. These include two exhibitions showcasing Indian art and artifacts, to celebrate 70 years of Indian independence. View the full list of exhibitions here. That rounds up our list of things to do in Cambridge this weekend. If you would like to visit Cambridge and learn English at the same time, visit our course page here.